Between the towns of Brugge and Gent on the Prins Boudewijnlaan at the village of Adegem in Belgium a large Canadian War Cemetery is located. 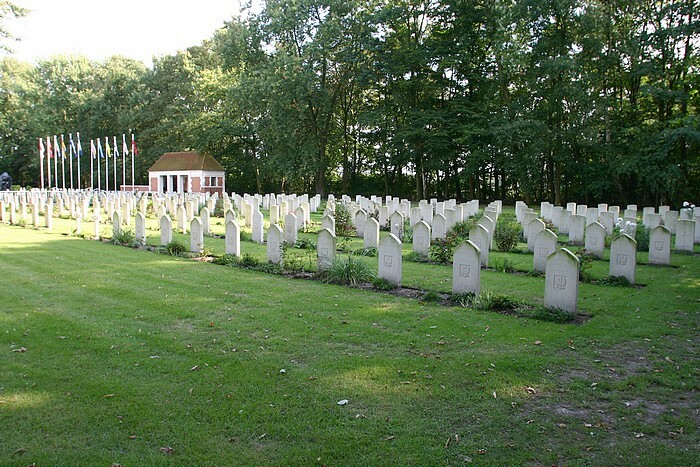 In this cemetery there are to be found the graves of 33 Polish soldiers who died in the Netherlands and Belgium. The French volontuur M. Mancau has been killed near the town of Axel, the Netherlands, in service of the 1st Polish Armoured Division. It's not clear why 21 Polish soldiers, who died at Axel in the Netherlands, were taken to this cemetery whilst the other Polish victims were buried in the town of Axel.